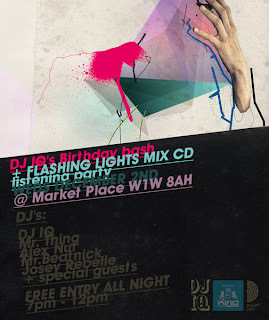 Promo video for IQ's upcoming mixtape, Flashing Lights, which is available from 30 Nov here and here. Features include Ramson Badbonez, Hey Zeus, Kashmere, Jehst, Stac, Joker Starr, Micall Parknsun, Professor Green, Gen, Sonny Jim, Pride, TB, Asaviour, Eva Lazurus. Beats come courtesy of IQ himself, The Mighty Hoax, Joker, Hudson Mo, Samiyam, Kid Sublime and more. Expect hip hop alongside dubstep and beats that you'll get tired trying to put in a genre. Also, don't forget the free mixtape launch party next Wednesday. Should be a corker! Click to see it the same but bigger.